Recipe for udupi style sambar. 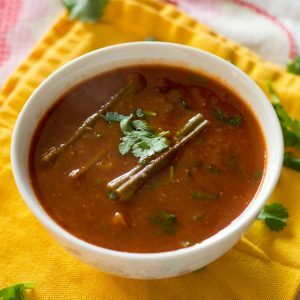 Udupi mangalorean style sambar recipe. It goes very well for dosa and rice. This recipe here is made without coconut. Karnataka / Kannada Special! Sambar made using home made sambar powder masala. Hotel style sambar! The cuisine of Udupi in the Mangalorean belt is so unique and special. Most of the vegetarian dishes in Udupi cuisine follows a Satvik tradition of no onions or garlic in their food. Here is my adaptation of Udupi style sambar. I have used drumstick (nuggekai) and brinjal for today’s sambar. 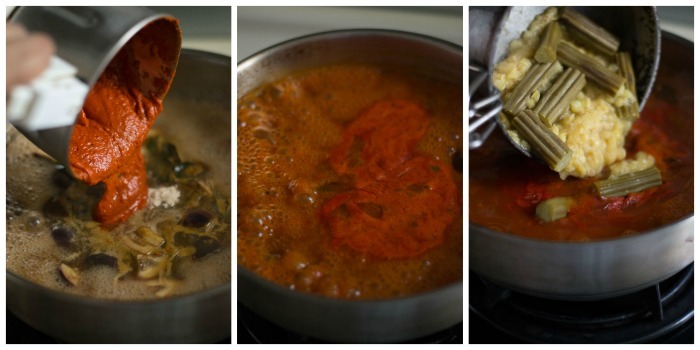 The main thing about the sambar is the sambar masala that’s homemade. The use of Byadagi chillies gives it a great colour and aroma to the dish. Byadagi Chillies come from the Haveri district in Karnataka. 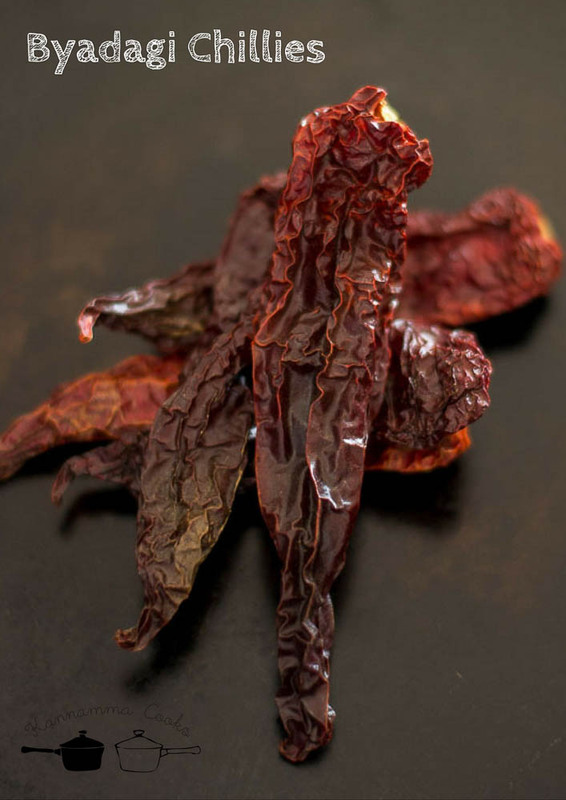 The chilli is long and wrinkled and deeply red. Its not very hot but imparts a dark color and aroma. Its not a very spicy variety of chilli. 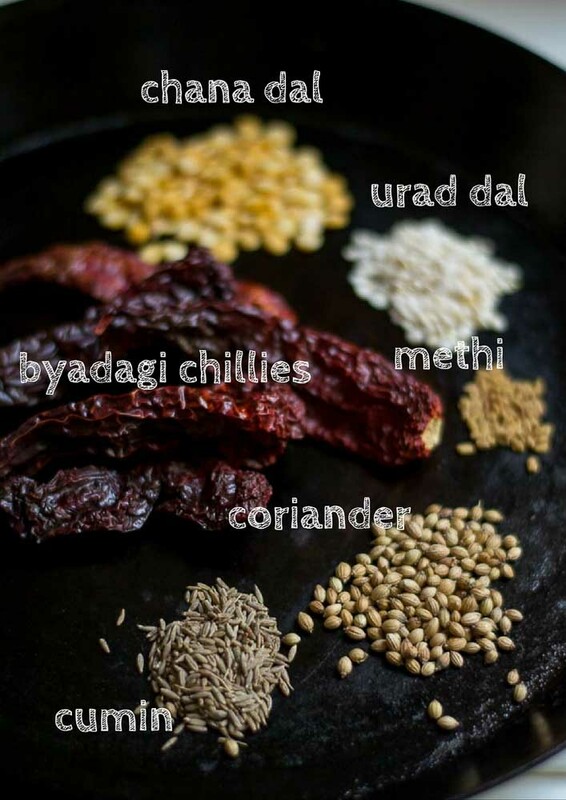 Here are the ingredients for the home made Udupi sambar powder masala. Take a pan and heat coconut oil until slightly hot. 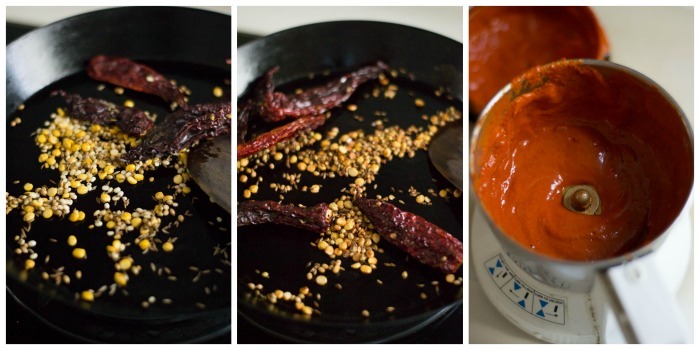 Add in all the ingredients of the sambar powder masala and roast on a low flame until the lentils are golden. Remove from heat and set aside on a plate to cool. Grind it with half a cup of water to a smooth paste. Set aside. Note: I have not added coconut today for the sambar masala. If you want a rich sambar, grind 1/4 cup of fresh shredded coconut along with the roasted ingredients. Next we will cook toor dal and drumstick in a pressure cooker. I always boil toor dal using pot in pot method in a cooker to avoid spewing. Ingredients like rice and lentils spew out of the whistle and make a mess all over the stove when cooked in a pressure cooker. To avoid this, add about a cup of water to the cooker and then add in a pot with dal, veggies and water and place it inside the cooker. By doing this, the dal will get cooked without spewing. But you will have to keep extra whistles than usual while cooking. I cooked for 8 whistles. Set aside. Now lets make Udupi Style Sambar. Let the mixture boil for 10 minutes. Add in the jaggery, salt and hing (asafoetida). 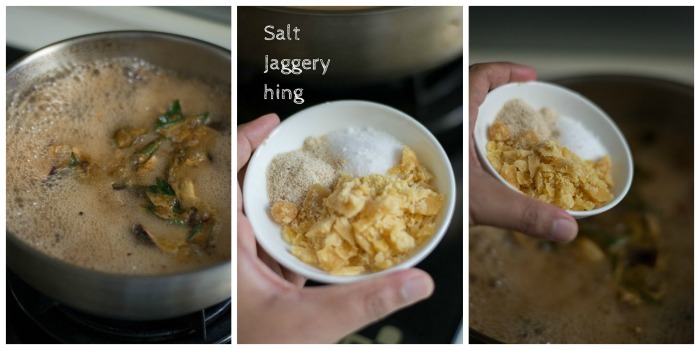 Jaggery is a very important ingredient in Udupi Sambar. 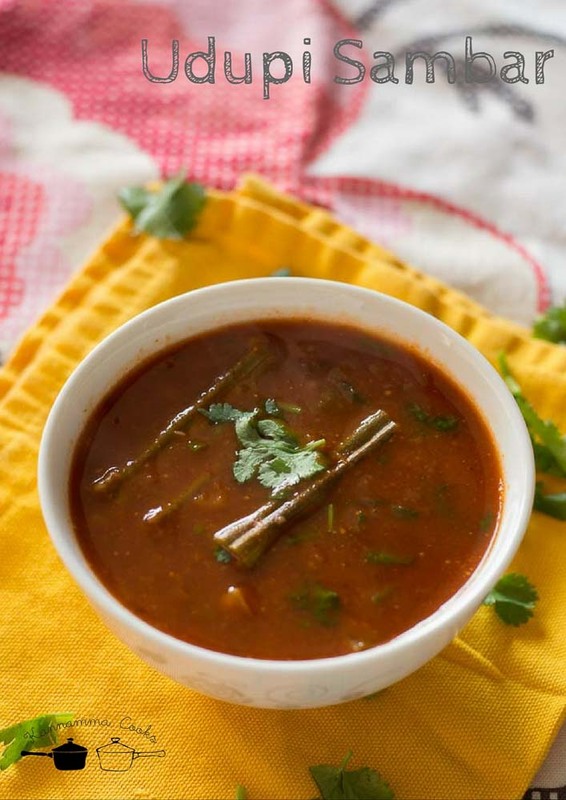 The sweet and spicy and sour and a lot of flavours make for the delicious taste of the sambar. Add in the ground sambar masala paste. Add half a cup of water to clean the mixie jar and add the water back to the pan. Let the mixture simmer for 5 more minutes. Add in the cooked dal mixture to the pan. Simmer briefly for a couple of minutes. Add in the chopped coriander leaves and switch off the flame. Mangalorean Udupi style Sambar is ready! Karnataka / Kannada special. 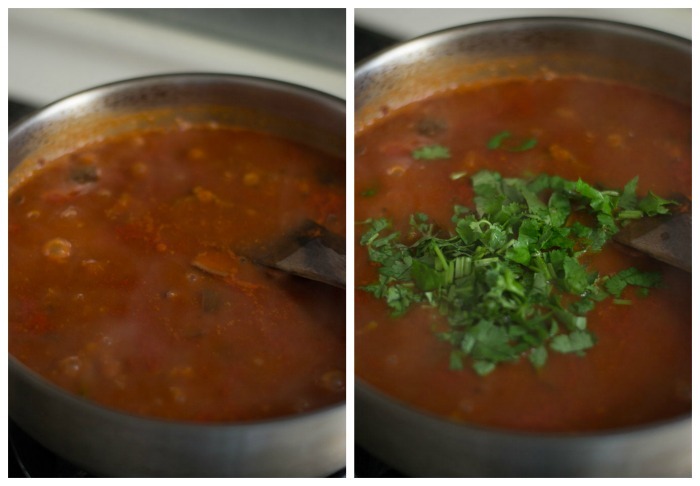 Recipe for udupi style sambar. 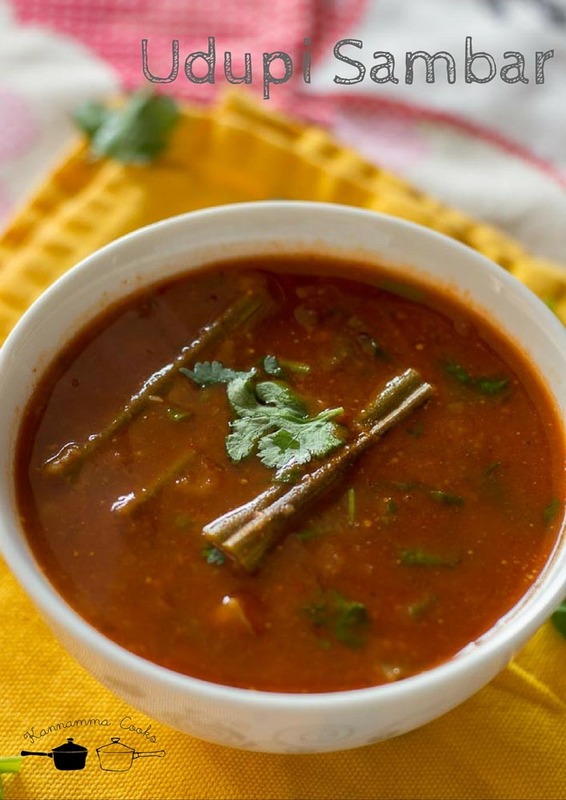 Udupi mangalorean style sambar recipe. It goes very well for dosa and rice. This recipe here is made without coconut. Kannada Special! 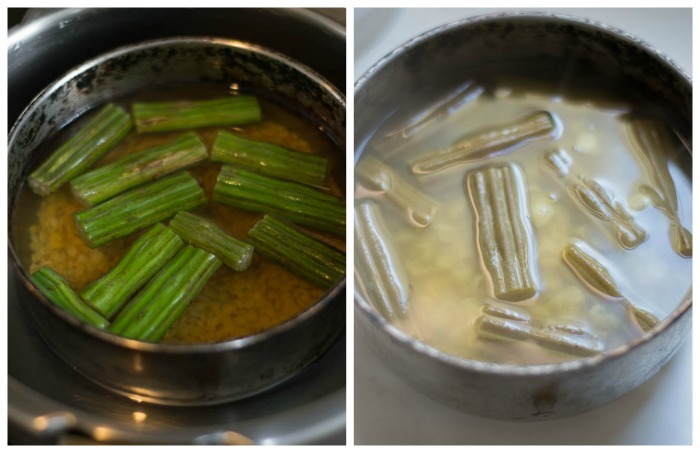 Boil the toor dal along with drumstick and water in a pressure cooker. Set aside. Heat oil in a pan and add in the mustard seeds and curry leaves. Let the mustard seeds splutter. Add in the tomatoes and brinjal. 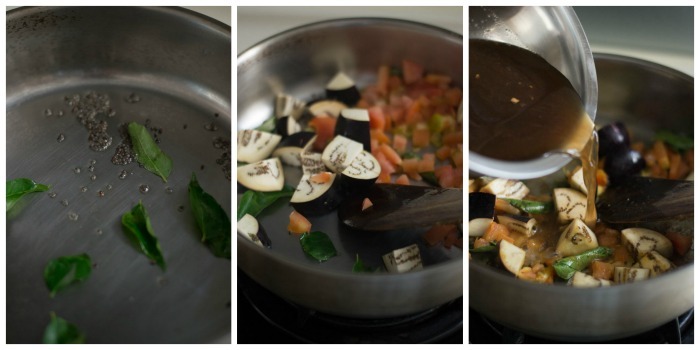 Saute for a couple of minutes. Add in the tamarind pulp. Let the mixture boil for 10 minutes. Add in the jaggery, salt and hing. Just made this rasam and the hubby says “PERFECT”. Thanks Suguna! Love this site it is the best for South Indian cooking. A new staple in my kitchen. recipe for Kerala nadan fish curry. Hi mam.I have a doubt.y u r using 2 tablespoons of juggery for this recipe.